Christ and the Two Thieves. 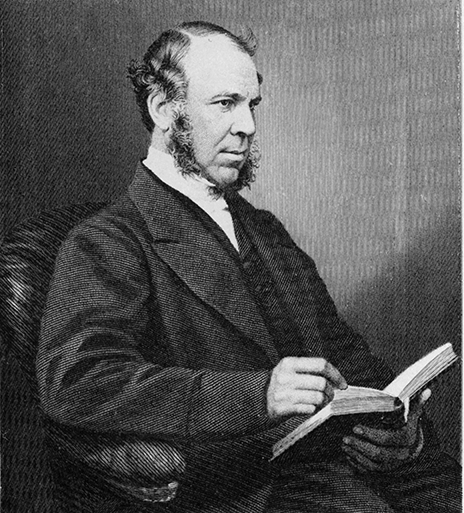 J. C. Ryle wrote well over two hundred evangelical tracts, of which more than two million were circulated, and many were translated into foreign languages. Throughout his ministry he remained one of the strongest defenders of the evangelical reformed faith within the Church of England. His faithful witness to the Gospel of Christ needs to be heard more than ever today. The following tract is a classic of Gospel Truth that readers came to expect from all his writings. 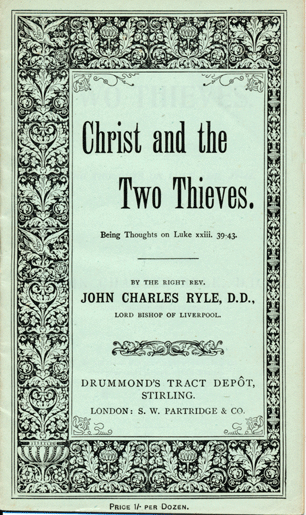 All his tracts are pure gold. Some of them, as they were republished by Drummond’s Tract Depot, Stirling, Scotland late in the 19th century, have come into my possession, and I offer them word for word as published while J. C. Ryle was Bishop of Liverpool. “And one of the malefactors which were hanged railed on him, saying, If thou be Christ, save thyself and us. “And we indeed justly; for we receive the due reward of our deeds but this man hath done nothing amiss. “And he said unto Jesus, Lord, remember me when thou comest into thy kingdom. “And Jesus said unto him, Verify I say unto thee, To-day shalt thou be with me in Paradise.” LUKE xxiii. 39–43. READER, you know these verses, I suppose. It would be strange indeed if you did not. Few passages in the New Testament are more familiar to men’s ears. And it is right and good that these verses should be well known. They have comforted many troubled minds. They have brought peace to many uneasy consciences. They have been a healing balm to many wounded hearts. They have been a medicine to many sin-sick souls. They have smoothed down not a few dying pillows. Wherever the Gospel of Christ is preached, they will always be honoured, loved, and had in remembrance. I. First of all, you are meant to learn from these verses, Christ’s power and willingness to save sinners. I ask you if any man’s case could look more hopeless and desperate, than that of this penitent thief once did? He was a wicked man,—a malefactor,—a thief, if not a murderer. We know this, for such only were crucified. He was suffering a just punishment for breaking the laws. And as he had lived wicked, so he seemed determined to die wicked,—for when he first was crucified, he railed on our Lord. But see now what happened. He ceased to rail and blaspheme, as he had done at the first. He began to speak in another manner altogether. He turned to our blessed Lord in prayer. He prayed Jesus to “remember him when He came into His kingdom.” He asked that his soul might be cared for, his sins pardoned, and himself thought of in another world. Truly this was a wonderful change. Now, have I not a right to say, Christ is able to save to the uttermost all them that come unto God by Him? Behold the proof of it. If ever sinner was too far gone to be saved, it was this thief. Yet he was plucked as a brand from the fire. Have I not a right to say, by grace ye may be saved through faith, not of works: fear not, only believe? Behold the proof of it. This thief was never baptized. He belonged to no visible Church. He never received the Lord’s Supper. He never did any work for Christ. He never gave money to Christ’s cause. But he had faith, and so he was saved. Have I not a right to say, the youngest faith will save a man’s soul, if it only be true? Behold the proof of it. This man’s faith was only one day old, but it led him to Christ, and preserved him from hell. What though your sins be more in number than the hairs of your head? What though your evil habits have grown with your growth, and strength­ened with your strength? What though you have hitherto hated good, and loved evil, all the days of your life? These things are sad indeed; but there is hope, even for you. Christ can heal you. Christ can raise you from your low estate. Heaven is not shut against you. Christ is able to admit you, if you will humbly commit your soul into His hands. Reader, are your sins forgiven? If not, I set before you this day a full and free salvation. I invite you to follow the steps of the penitent thief: come to Christ, and live. I tell you that Jesus is very pitiful, and of tender mercy. I tell you He can do everything that your soul requires. Though your sins be as scarlet, He will make them white as snow; though they be red like crimson, they shall be as wool. Why should you not be saved as well as another? Come unto Christ, and live. Reader, are you a true believer? If you are, you ought to glory in Christ. Glory not in your own faith, your own feelings, your own knowledge, your own prayers, your own amendment, your own diligence. Glory in nothing but Christ. Alas, the best of us knows but little of that merciful and mighty Saviour! We do not exalt Him and glory in Him enough. Let us pray that we may see more of the fulness there is in Him. II. The second lesson you are meant to learn from this passage is this,—if some are saved in the very hour of death, others are not. This is a truth that never ought to he passed over, and I dare not leave it unnoticed. It is a truth that stands out plainly in the sad end of the other malefactor, and is only too often forgotten. What became of the other thief who was crucified? Why did he not turn from his sin, and call upon the Lord? Why did he remain hardened and impenitent? Why was he not saved? It is useless to try to answer such questions. Let us be content to take the fact as we find it, and see what it is meant to teach us. Now these things are written for our warning. There is warning, as well as comfort in these verses, and that very solemn warning too. They tell me loudly, that though some may repent and be converted on their death-beds, it does not at all follow that all will. A death-bed is not always a saving time. They tell me loudly that two men may have the same opportunities of getting good for their souls,—may be placed in the same position, see the same things, and hear the same things; and yet only one shall take advantage of them, repent, believe, and be saved. They tell me, above all, that repentance and faith are the gifts of God, and are not in a man’s own power; and that if any one flatters himself he can repent at his own time, choose his own season, seek the Lord when he pleases, and, like the penitent thief, be saved at the very last,—he may find at length he is greatly deceived. And it is good and profitable to bear this in mind. There is an immense amount of delusion in the world on this very subject. I see many allowing life to slip away, all unprepared to die. I see many allowing that they ought to repent, but always putting off their own repentance. And I believe one grand reason is, that most men suppose they can turn to God just when they like. They wrest the parable of the labourer in the vineyard, which speaks of the eleventh hour, and use it as it never was meant to be used. They dwell on the pleasant part of the verses I am now considering, and forget the rest. They talk of the thief that went to paradise, and was saved, and forget the one who died as he had lived, and was lost. Reader, take heed that you do not fall into this mistake. Look at the history of men in the Bible, and see how often these notions I have been speaking of are contradicted. Mark well how many proofs there are that two men may have the same light offered them, and only one use it; and that no one has a right to take liberties with God’s mercy, and presume he will be able to repent just when he likes. Look at Saul and David. They lived about the same time. They rose from the same rank in life. They were called to the same position in the world. They enjoyed the ministry of the same prophet, Samuel. They reigned the same number of years.—Yet one was saved and the other lost. Look at the world around you. See what is going on continually under your eyes. Two sisters will often attend the same ministry, listen to the same truths, hear the same sermons; and yet only one shall be converted unto God, while the other remains totally unmoved. Two friends often read the same religious book. One is so moved by it, that he gives up all for Christ; the other sees nothing at all in it, and continues the same as before. Hundreds have read Doddridge’s “Rise and Progress” without profit: with Wilberforce it was one of the beginnings of spiritual life. Thousands have read Wilberforce’s “Practical View of Christianity,” and laid it down again unaltered;—from the time Legh Richmond read it he became another man. No man has any warrant for saying, Salvation is in my own power. You must not misunderstand me. I do not want to discourage you. I say these things in all affection, to give you warning of danger. I do not say them to drive you back from heaven;—I say them rather to draw you on, and bring you to Christ while He can be found. I want you to beware of presumption. Do not abuse God’s mercy and compassion. Do not continue in sin, I beseech you, and think you can repent, and believe, and be saved, just when you like, when you please, when you will, and when you choose. I would always set before you an open door. I would always say, “While there is life there is hope.” But if you would be wise, put nothing off that concerns your soul. I want you to beware of letting slip good thoughts and godly convictions, if you have them. Cherish them and nourish them, lest you lose them for ever. Make the most of them, lest they take to themselves wings and flee away. Have you an inclination to begin praying? Put it in practice at once. Have you an idea of beginning really to serve Christ? Set about it at once. Are you enjoying any spiritual light? See that you live up to your light. Trifle not with opportunities, lest the day come when you will want to use them, and not be able. Linger not, lest you become wise too late. You may say, perhaps, “it is never too late to repent.” I answer, That is right enough, but late repentance is seldom true. And I say further, You cannot be certain if you put off repenting, you will repent at all. You may say, “Why should I be afraid?—the penitent thief was saved.” I answer, That is true, but look again at the passage which tells you that the other thief was lost. III. The third lesson you are meant to learn from these verses is this,—the Spirit always leads saved souls in one way. They do not consider the evidences this thief left behind him. They do not observe the abundant proof he gave of the work of the Spirit in his heart. And these proofs I wish to trace out. I wish to show you that the Spirit always works in one way, and that whether He converts a man in an hour, as He did the penitent thief,—or whether by slow degrees, as he does others, the steps by which He leads souls to heaven are always the same. Listen to me, reader, and I will try to make this clear to you. I want you to shake off the common notion that there is some easy royal road to heaven from a dying bed. I want you thoroughly to understand that every saved soul goes through the same experience, and that the leading principles of the penitent thief’s religion were just the same as those of the oldest saint that ever lived. He called Jesus, “Lord.” He declared his belief that He would have a kingdom. He believed that He was able to give him eternal life and glory, and in this belief prayed to Him. He maintained His innocence of all the charges brought against Him. “This man,” said he, “hath done nothing amiss.” Others perhaps may have thought the Lord innocent,—none said so openly but this poor dying man. And when did all this happen? It happened when the whole nation had denied Christ,—shouting, “Crucify Him! crucify Him! We have no king but Cæsar!”—when the chief priests and Pharisees had condemned and found Him guilty of death,—when even His own disciples had forsaken Him and fled,—when He was hanging, faint, bleeding and dying on the cross, numbered with transgressors, and accounted accursed. This was the hour when the thief believed in Christ, and prayed to Him. Surely such faith was never seen since the world began. The disciples had seen mighty signs and miracles. They had seen the dead raised with a word,—and lepers healed with a touch,—the blind receiving sight,—the dumb made to speak,—the lame made to walk. They had seen thousands fed with a few loaves and fishes. They had seen their Master walking on the water as on dry land. They had all of them heard Him speak as no man ever spake, and hold out promises of good things yet to come. They had some of them had a foretaste of His glory in the mount of transfiguration. Doubtless their faith was the gift of God, but still they had much to help it. The dying thief saw none of the things I have mentioned. He only saw our Lord in agony, and in weakness, in suffering, and in pain. He saw Him undergoing a dishonourable punishment; deserted, mocked, despised, blasphemed. He saw Him rejected by all the great, and wise, and noble of His own people,—His strength dried up like a potsherd, His life drawing nigh to the grave. (Psa. xxii. 15; lxxxviii. 3.) He saw no sceptre, no royal crown, no outward dominion, no glory, no majesty, no power, no signs of might. And yet the dying thief believed, and looked forward to Christ’s kingdom. Reader, would you know if you have the Spirit? Then mark the question I put to you this day.—Where is your faith in Christ? Reader, would you know if you have the Spirit? Then mark my question.—Do you feel your sin? See, for another thing, what brotherly love the thief showed to his companion. He tried to stop his railing and blaspheming, and bring him to a better mind. “Dost not thou fear God,” he says, “seeing thou art in the same condemnation?” There is no surer mark of grace than this. Grace shakes a man out of his selfishness, and makes him feel for the souls of others. When the Samaritan woman was converted, she left her water-pot and ran to the city, saying, “Come, see a man that told me all things that ever I did: is not this the Christ?” When Saul was converted, immediately he went to the synagogue at Damascus, and testified to his brethren of Israel, that Jesus was the Christ. Reader, would you know if you have the Spirit? Then where is your charity and love to souls? In one word, you see in the penitent thief a finished work of the Holy Ghost. Every part of the believer’s character may be traced in him. Short as his life was after conversion, he found time to leave abundant evidence that he was a child of God. His faith, his prayer, his humility, his brotherly love, are unmistakable witnesses of the reality of his repentance. He was not a penitent in name only, but in deed and in truth. Let no man therefore think, because the penitent thief was saved, that men can be saved without leaving any evidence of the Spirit’s work.. Let such an one consider well what evidence this man left behind, and take care. It is mournful to hear what people sometimes say about what they call death-bed evidences. It is perfectly fearful to observe how little satisfies some persons, and how easily they can persuade themselves that their friends are gone to heaven. They will tell you when their relation is dead and gone, that “he made such a beautiful prayer one day,—or that he talked so well,—or that he was so sorry for his old ways, and intended to live so differently if he got better,—or that he craved nothing in this world,—or that he liked people to read to him, and pray with him.” And because they have this to go upon, they seem to have a comfortable hope that he is saved. Christ may never have been named,—the way of salvation may never have been in the least mentioned. But it matters not; there was a little talk of religion, and so they are content. Now I have no desire to hurt the feelings of anyone who reads this paper, but I must and will speak plainly upon this subject. Once for all, let me say, that as a general rule, nothing is so unsatisfactory as death-bed evidences. The things that men say, and the feelings they express when sick and frightened, are little to be depended on. Often, too often, they are the result of fear, and do not spring from the ground of the heart. Often, too often, they are things said by rote; caught from the lips of ministers and anxious friends, but evidently not felt. And nothing can prove all this more clearly, than the well-known fact, that the great majority of persons who make promises of amendment on a sick-bed, if they recover, go back to sin and the world. When a man has lived a life of thoughtlessness and folly, I want something more than a few fair words and good wishes to satisfy me about his soul, when he comes to his death-bed. It is not enough for me that he will let me read the Bible to him, and pray by his bedside; that he says, “he has not thought so much as he ought of religion, and he thinks he should be a different man if he got better.” All this does not content me,—it does not make me feel happy about his state. It is very well as far as it goes, but it is not conversion. It is very well in its way, but it is not faith in Christ. Until I see conversion, and faith in Christ, I cannot and dare not feel satisfied. Others may feel satisfied if they please, and after their friend’s death say, they hope he is gone to heaven. For my part I would rather hold my tongue, and say nothing. I would be content with the least measure of repentance and faith in a dying man, even though it be no bigger than a grain of mustard seed; but to be content with anything less than repentance and faith, seems to me next door to infidelity. Reader, what kind of evidence do you mean to leave behind as to the state of your soul? Take example by the penitent thief, and you will do well. When we have carried you to your narrow bed, let us not have to hunt up stray words, and scraps of religion, in order to make out that you were a true believer. Let us not have to say in a hesi­tating way one to another, “I trust he is happy: he talked so nicely one day, and he seemed so pleased with a chapter in the Bible on another occasion, and he liked such a person, who is a good man.” Let us be able to speak decidedly as to your condition. Let us have some standing proof of your penitence, your faith, and your holiness, that none shall be able for a moment to question your state. Depend on it, without this, those you leave behind can feel no solid comfort about your soul. We may use the form of religion at your burial, and express charitable hopes. We may meet you at the church-yard gate, and say, “Blessed are the dead that die in the Lord.” But this will not alter your condition. If you die without conversion to God,—without repentance,—and without faith, your funeral will only be the funeral of a lost soul. IV. You are meant, in the next place, to learn from these verses, that believers in Christ when they die, are with the Lord. I shall say but little on this subject. I would simply lay it before you, for your own private meditations. To my own mind it is very full of comfort and peace. Believers after death are “with Christ.” That answers many a difficult question, which otherwise might puzzle man’s busy, restless mind. The abode of dead saints, their joys, their feelings, their happiness, all seems met by this simple expression,—they are with Christ. I cannot enter into full explanations about the state of departed believers. It is a high and deep subject, such as man’s mind can neither grasp nor fathom. I know their happiness falls short of what it will be when their bodies are raised again, and Jesus returns to earth. Yet I know also they enjoy a blessed rest,—a rest from labour,—a rest from sorrow,—a rest from pain,—and a rest from sin. But it does not follow because I cannot explain these things, that I am not persuaded they are far happier than they ever were on earth. I see their happiness in this very passage, “They are with Christ,” and when I see that I see enough. If the sheep are with the Shepherd,—if the members are with the Head,—if the children of Christ’s family are with Him who loved them and carried them all the days of their pilgrimage on earth, all must be well, all must be right. V. The last thing you are meant to learn from these verses is this,—the eternal portion of every man’s soul is close to him. Reader, how near that seems! How awfully near that word brings our everlasting dwelling-place. Happiness or misery,—sorrow or joy,—the presence of Christ, or the company of devils,—all are close to us. “There is but a step,” says David, “between me and death.” There is but a step, we may say, between ourselves and either paradise or hell. We none of us realize this as we ought to do. It is high time to shake off the dreamy state of mind in which we live on this matter. We are apt to talk and think, even about believers, as if death was a long journey,—as if the dying saint had embarked on a long voyage. It is all wrong, very wrong. Their harbour and their home is close by, and they have entered it. Reader, the day that believers die they are in paradise. Their battle is fought;—their strife is over. They have passed through that gloomy valley we must one day tread;—they have gone over that dark river we must one day cross. They have drank that last bitter cup which sin has mingled for man. They have reached that place where sorrow and sighing are no more. Surely we should not wish them back again. We should not weep for them, but for ourselves. We are warring still, but they are at peace. We are labouring, but they are at rest. We are watching, but they are sleeping. We are wearing our spiritual armour, but they have for ever put it off. We are still at sea, but they are safe in harbour. We have tears, but they have joys. We are strangers and pilgrims, but as for them they are at home. Surely, better are the dead in Christ than the living. Surely, the very hour the poor saint dies, he is at once higher and happier than the highest upon earth. I fear there is a vast amount of delusion on this point. I fear that many, who are not Roman Catholics, and profess not to believe purgatory, have, notwithstanding, some strange ideas in their minds about the immediate consequences of death. I fear that many have a sort of vague notion that there is some interval or space of time between death and their eternal state. They fancy they shall go through a kind of purifying change, and that though they die unfit for heaven, they shall yet be found meet for it after all. But it will not stand. There is no change after death. There is no conversion in the grave. There is no new heart given after the last breath is drawn. The very day we go, we launch for ever. The day we go from this world, we begin an eternal condition. From that day there is no spiritual alteration,—no spiritual change. As we die, so we shall receive after death. As the tree falls so it must lie. Reader, if you are an unconverted man, this ought to make you think. Do you know you are close to hell? This very day you might die, and if you died out of Christ, you would open your eyes in hell, and in torment. This tract may fall into the hands of some humble-hearted and contrite sinner.—Are you that man? Then here is encouragement for you. See what the penitent thief did, and do likewise. See how he prayed,—see how he called on the Lord Jesus Christ,—see what an answer of peace he obtained. Brother or sister, why should not you do the same? Why should not you also be saved? This tract may fall into the hands of some proud and presumptuous man of the world,—Are you that man? Then take warning. See how the impenitent thief died as he had lived, and beware lest you come to a like end. Oh, erring brother or sister, be not too confident, lest you die in your sins! Seek the Lord while He may be found. Turn you, turn: why will you die? This tract may fall into the hands of some professing believer in Christ.—Are you such an one? Then take the penitent thief’s religion as a measure by which to prove your own. See that you know something of true repentance and saving faith, of real humility and fervent charity. Brother or sister, do not be satisfied with the world’s standard of Christianity. Be of one mind with the penitent thief, and you will be wise. This tract may fall into the hands of someone who is mourning over departed believers.—Are you such an one? Then take comfort from this Scripture. See how your beloved ones are in the best of hands. They cannot be better off. They never were so well in their lives as they are now. They are with Jesus, whom their souls loved on earth. Oh, cease from your selfish mourning! Rejoice rather that they are freed from trouble, and have entered into rest. And this tract may fall into the hands of some aged servant of Christ.—Are you such an one? Then see from these verses how near you are to home. A few more days of labour and sorrow, and the King of kings shall send for you; and in a moment your warfare shall be at end, and all shall be peace. “O Saviour, what a precedent is this of Thy free and powerful grace! Where Thou wilt give, what unworthiness can bar us from Thy mercy? When Thou wilt give, what time can prejudice our vocation? Who can despair of Thy goodness, when he, that in the morning was posting to hell, is in the evening with Thee in paradise?”—BISHOP HALL. “He that puts off his repentance and seeking for pardon to the very last, in reliance upon this example, does but tempt God, and turn that to his own poison, which God intended for better ends. “The mercies of God are never recorded in Scripture for man’s presumption, and the failings of men never for imitation.”—LIGHTFOOT. Sermon. 1684. “Most ungrateful and foolish is the conduct of those who take encouragement from the penitent thief to put off repentance to a dying moment;—most ungrateful in perverting the grace of their Redeemer into an occasion of renewing their provocations against Him;—and most foolish to imagine that what our Lord did in so singular circumstances, is to be drawn into an ordinary precedent.”—DODDRIDGE. “I know not that since the creation of the world there ever was a more remarkable and striking example of faith.”—CALVIN'S COMMENTARY ON THE GOSPELS. “A great faith that can see the sun under so thick a cloud; that can discover a Christ, a Saviour, under such a poor, scorned, despised, crucified Jesus, and call Him Lord. “A great faith that could see Christ’s kingdom through His cross, and grave, and death, and when there was so little sign of a kingdom, and pray to be remembered in that kingdom.” LIGHTFOOT Sermon. 1684. “The penitent thief was the first confessor of Christ’s heavenly kingdom,—the first martyr who bore testimony to the holiness of His sufferings,—and the first apologist for His oppressed innocence.”—QUESNEL ON THE GOSPELS. “Probably there are few saints in glory who ever honoured Christ more illustriously than this dying sinner.”—DODDRIDGE. “Is this the voice of a thief or a disciple? Give me leave, O Saviour, to borrow Thine own words, ‘Verily I have not found so great faith, no not in Israel.’ He saw Thee hanging miserably by him, and yet styles Thee Lord. He saw Thee dying, and yet talks of Thy kingdom. He felt himself dying, yet talks of a future remembrance. O faith, stronger than death, which can look beyond the cross at a crown;—beyond dissolution at a remembrance of life and glory! Which of Thine eleven were heard to speak so gracious a word to Thee in these Thy last pangs? “—BISHOP HALL. “We ought not to enter into curious and subtle arguments about the place of paradise. Let us rest satisfied with knowing that those who are engrafted by faith into the body of Christ are partakers of life, and there enjoy after death a blessed and joyful rest, until the perfect glory of the heavenly life is fully manifested by the coming of Christ.”—CALVIN’S COMMENTARY ON THE GOSPELS. “We give Thee hearty thanks, for that it hath pleased Thee to deliver this our brother out of the miseries of this sinful world.”—CHURCH OF ENGLAND BURIAL SERVICE. “I have some of the best news to impart. One beloved by you has accomplished her warfare; has received an answer to her prayers, and everlasting joy rests upon her head. My dear wife, the source of my best earthly comfort for twenty years, departed on Tuesday.”—VENN’S TO LETTER STILLINGFLEET, announcing the death of his wife.